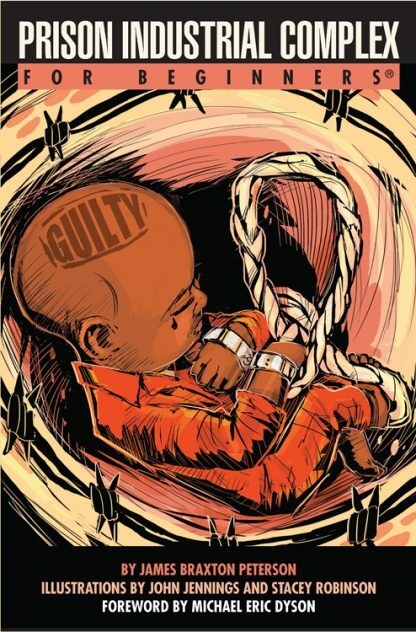 Red Wheel ∕ Weiser Online Bookstore | Prison Industrial Complex For Beginners by James Braxton Peterson, Illustrated by John Jennings, Illustrated by Stacey Robinson et al. Prison Industrial Complex For Beginners is a graphic narrative project that attempts to distill the fundamental components of what scholars, activists, and artists have identified as the Mass Incarceration movement in the United States. Since the early 1990s, activist critics of the US prison system have marked its emergence as a �complex� in a manner comparable to how President Eisenhower described the Military Industrial Complex. Like its institutional �cousin,� the Prison Industrial Complex features a critical combination of political ideology, far-reaching federal policy, and the neo-liberal directive to privatize institutions traditionally within the purview of the government. The result is that corporations have capital incentives to capture and contain human bodies. The Prison Industrial Complex relies on the �law and order� ideology fomented by President Nixon and developed at least partially in response to the unrest generated through the Civil Rights Movement. It is (and has been) enhanced and emboldened via the US �war on drugs,� a slate of policies that by any account have failed to do anything except normalize the warehousing of nonviolent substance abusers in jails and prisons that serve more as criminal training centers then as redemptive spaces for citizens who might re-enter society successfully. Prison Industrial Complex For Beginners is a primer for how these issues emerged and how our awareness of the systems at work in mass incarceration might be the very first step in reforming an institution responsible for some of our most egregious contemporary civil rights violations. James Braxton Peterson is Director of Africana Studies and Associate Professor of English at Lehigh University. He is the author of The Hip Hop Underground and African American Culture and hosts �The Remix� on Philadelphia NPR affiliate, WHYY. Peterson is a regular blogger for the Huffington Post, and a contributor to TheGrio.com and MSNBC. John Jennings is an Associate Professor at the University of Buffalo, NY. Michael Eric Dyson, is a three-time NAACP Award winner, an American Book Award winner, a political analyst for MSNBC, and the author of sixteen books, including I May Not Get There With You: The True Martin Luther King Jr.. He is currently University Professor of Sociology at Georgetown University. He lives in Washington, D.C..